Every year around Halloween, Cedar Point in Sandusky, Ohio transforms into a thrill seeker’s haunted paradise. While all of the typical fun remains, such as the rollercoasters and traditional park treats, they also add into the mix several temporary haunted attractions. Now, you may have heard that Halloweekends at Cedar Point is a bit too scary for some kids. While that may be true during the evening hours, we’ve found that the daytime is the perfect time to visit with those who are a bit more fearful. 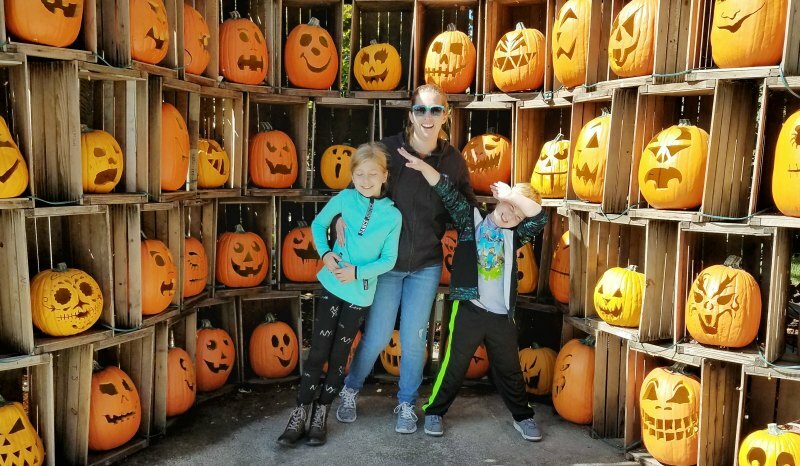 Read on to see what advice our Retro TravelingMom has to say about taking young kids to Halloweekends at Cedar Point. 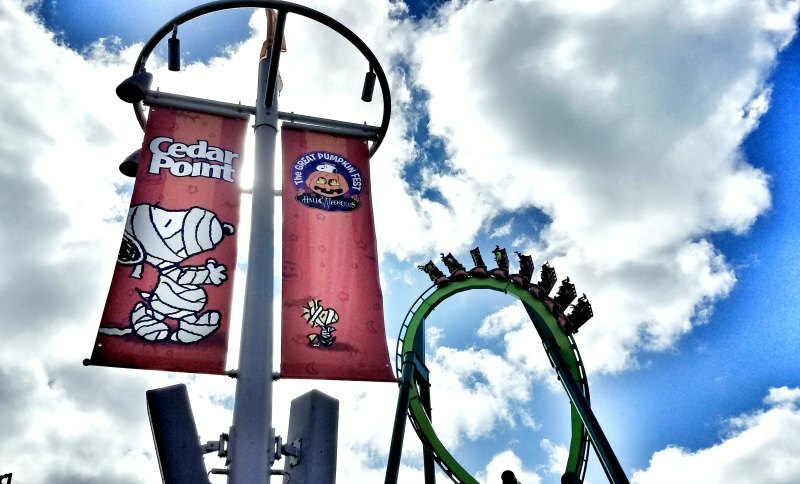 From September 15th through October 29th, Cedar Point transforms into Halloweekends. An event that celebrates The Great Pumpkin Fest during the day but also puts fear to a test during the evening Haunt. These two separate themes make up one Halloweekends and we’ve got the perfect brew for making it suitable when visiting with young kids. I have the most chicken family when it comes to all things Halloween related. If it’s scary, we don’t want any part of it. So when we decided to visit Cedar Point for their Halloweekends celebration, I had my reservations. From what I had heard, Halloweekends can terrify even the most confident of souls. Something we are definitely not! What we found during our time at Cedar Point Halloweekends was that the park definitely has the ability to haunt. Yet it also offes a lot for those looking for some good old-fashioned harvest fun. 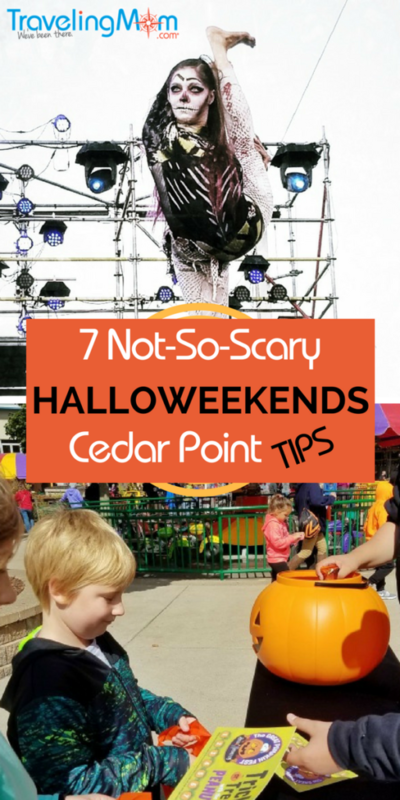 Here is our list of what we found that is not-so-scary at Cedar Point Halloweekends. Located in the Kiddy Kingdom, kids can grab a bag and make their way around to the eight provided trick-or-treat stations. Each stop gives them a small toy or treat! 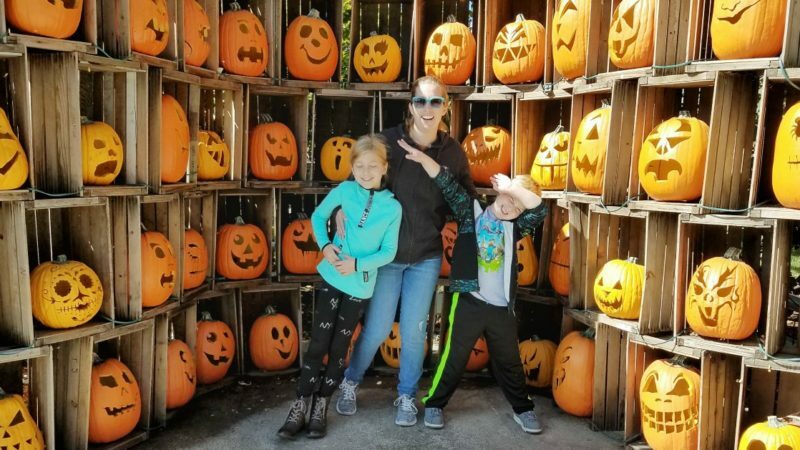 Then, after they are done trick-or-treating, they can take their completed punch card to the pumpkin patch and paint their very own pumpkin to take home. Not only did my kids love getting the free treats, but I loved that they had them to snack on throughout the day while having fun at Cedar Point. Don’t worry – it isn’t all candy! My kids also got pretzels and an apple! As a mom, I love when theme parks have parades because it gives me a chance to relax and catch my breath while the kids are happily entertained. 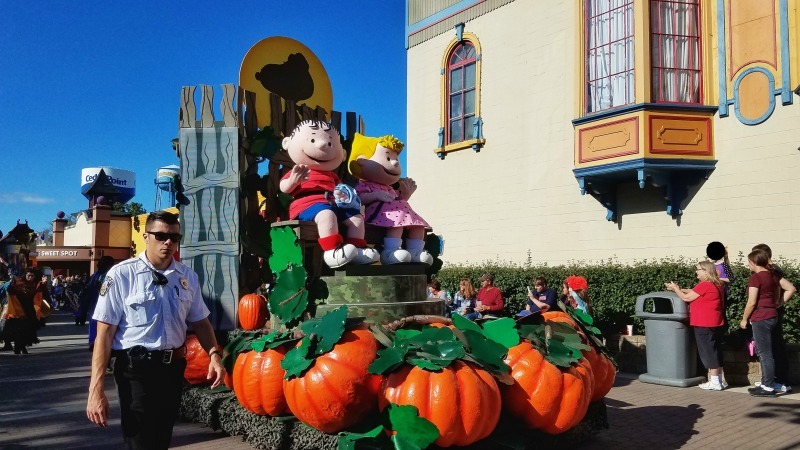 During Halloweekends at Cedar Point, I was excited to find that The Great Pumpkin Parade filled Mainstreet every Saturday and Sunday at 4 pm. When 4 pm arrived, we quickly found a park bench to sit on along the route and snacked on the treats we got while trick-or-treating in the Kiddy Kingdom. The parade included dancing, music and large floats – my kids loved it. Although Cedar Point has some top thrilling roller coasters, they also have areas of the park that are designed specifically for the younger crowd and their families. 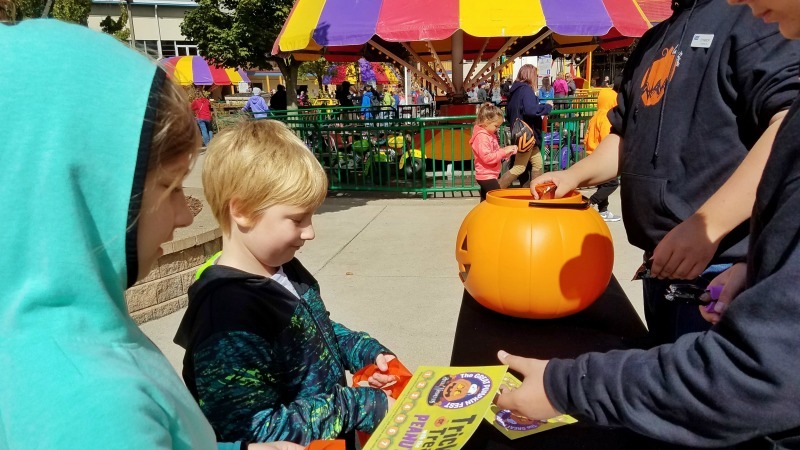 During Halloweekends, these areas include bonus Halloween fun such as coloring stations, spooky games like eye-spy, and a hay maze. My kids ended up spending hours in these areas, which I didn’t mind because it was pretty fun for the parents as well. They even had a few rides I could go on alongside them. One of the things that impressed me the most at Cedar Point’s Halloweekends were the live shows! These scheduled shows, along with their descriptions, can be found on the paper map handed out upon entrance to the park. We scoped out a few that were kid friendly and enjoy every moment of them! Looking for a show that the whole family might enjoy? 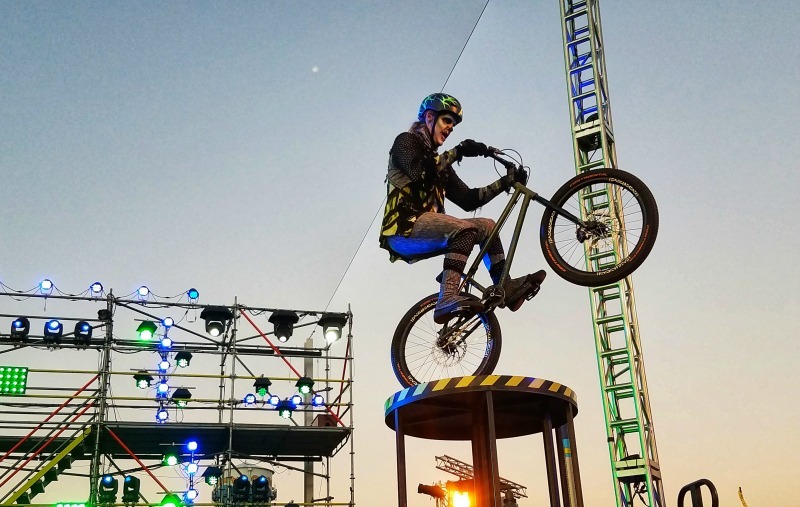 Our favorite pick was The Skeleton Crew – it combines thrill seeker stunts like bicycle tricks and high wire walking with comedy and music. During Halloweekends, Cedar Point is full of different haunted houses. For younger guests or those not wanting to be scared, these probably should stay off the list. However, there is one you may want to try: Magical House on Boo Hill. This less spooky haunted house is full of surprises – like the special treat given to kids after they make it through. For those looking for something a little bit more frightening, Hexed Spellbound offers a toned-down daytime haunt. One thing not to be missed during Halloweekends at Cedar Point is the decor! 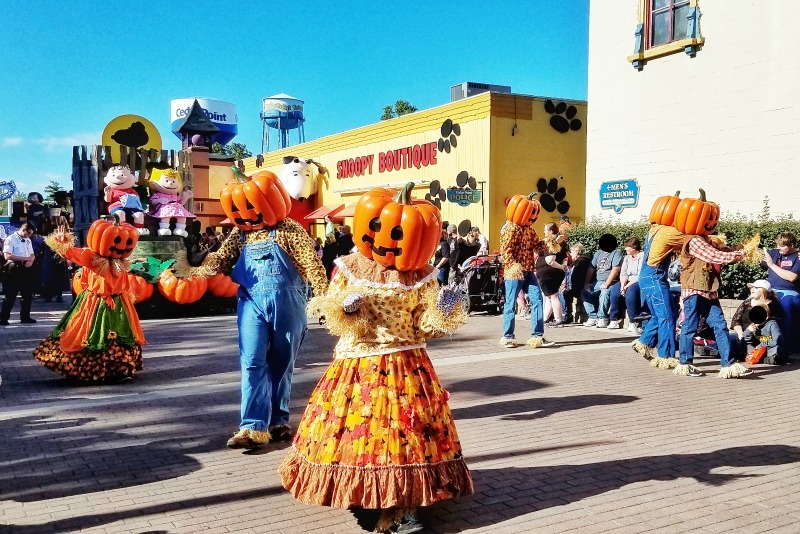 There are animatronic displays, humorous headstones, and over 1,000 hand-carved pumpkins throughout the park to enjoy. These also make great photo opportunities during the day. However, I will warn you. After the sun sets, many of these decorations come to life with live characters added in. Real zombies wandering the graveyard, anyone? Even though many people go to Halloweekends for a fright, Cedar Point understands that not everybody likes to be scared. In order to allow guests a voice who don’t want to be messed, they have special light up “Don’t Scare Me” necklaces available in the gift shops. When guests are wearing one of these necklaces, it tells the ghosts and goblins to just walk on by. Can You Make it Through the Night? Even though Cedar Point is not-so-scary during the day when the sun set’s a whole different story! Luckily, Castaway Bay is right down the road and makes for another fun stop in Sandusky, Ohio. Read more about this indoor waterpark and hotel here. Have you ever been to Halloweekends Cedar Point? What do you recommend doing that is not-so-scary? Tell us in the comments.